Not much to say about this page, really. I was experimenting with how to shade the shrubbery. I’m not sure if it turned out as good as I wanted, but I’ll keep working at it. 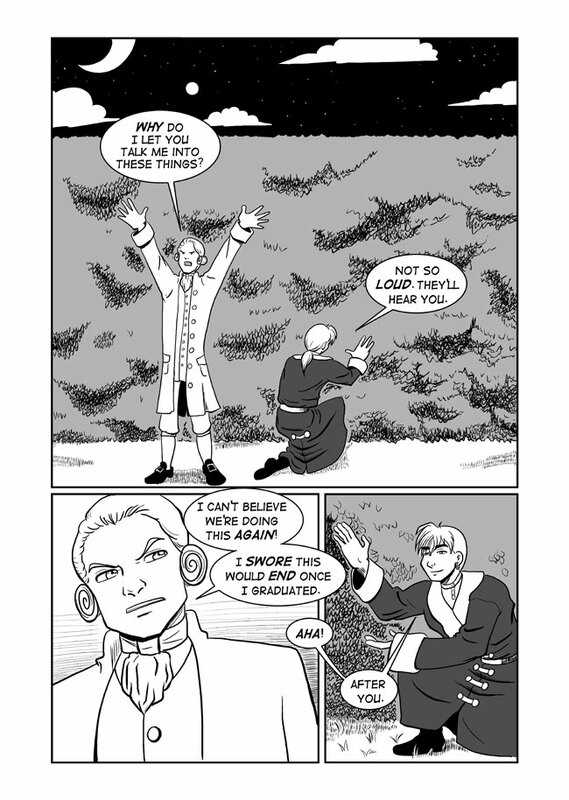 Vote incentive this week is Jonathan in a tuxedo! I’m working on bookmarks to sell and I’ve been dying to try out a new technique with my copics so I figured I’d kill two birds with one stone. You’ll see the original artwork this week; the bookmark will be cropped and changed a bit. And Jonathan looks really good in a tux. Really good. The set will have Jonathan, Jared, Yvette, Rodney, Henry, and Elizabeth. If you have any other preferences, let me know and I’ll see if I can include them. I spent much of the weekend playing Skyrim and working on my Bethany costume. In Skyrim, I managed to get through Boss Battle Part one. Man, that was rough. I am not looking forward to Boss Battle Part 2. Inbetween battles, I spend a lot of time smithing. I love smithing in Skyrim; it gives me a sense of accomplishment. You can level smithing, entnancihg, the preferred combat skill, speech, and make some money by using an enchanted weapon with soul trap and hunting. If you have a lot of petty soul gems then they fill up. Getting the hides from hunting makes leather and leather strips. Forge leather bracers out of the leather. You can enchant the bracers with which ever enchantment increases the price and sell them. This would take some time, but worth it. An easier and more expensive route would be to buy iron and make daggers, but if you have the banishment enchantment it would pay itself off over time, as many merchants don’t carry enough gold to sell more than 2 at a time depending on speech level.